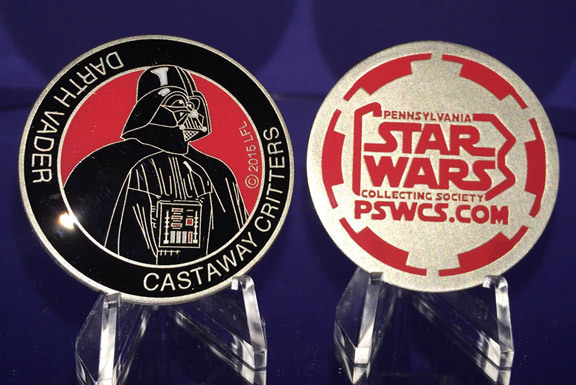 The Pennsylvania Star Wars Collecting Society is honored to support Castaway Critters through a special charitable fundraiser. We sold medallions featuring Darth Vader. The medallions were produced in a one-time run of 1000 medallions with the permission of Lucasfilm Ltd. All proceeds generated through the sale of these medallions will be donated to Castaway Critters. Castaway Critters, The James A. Hueholt Memorial Foundation for Animals is a local grass-roots No-Kill animal rescue founded by Barbara Holmes and friends and family of James A. Hueholt, who died in 1994 at age 37. Jim rescued and cared for many animals himself. Our work in lessening the suffering of companion animals is a tribute to him and to his love of life. These medallions were inspired by the concept of "challenge coins" which are popular among military personnel.